Semimembranosus tendinopathy (SMT) is an uncommon cause of chronic knee pain. Owing to a lack of understanding of the condition, it may be under-diagnosed or inadequately treated. The incidence of semimembranosus tendinopathy is unknown in the athletic population and is probably more common in older patients. The usual presentation for SMT is pain on the posteromedial side of the knee. Physical examination can usually localize the area of tenderness to the distal semimembranosus tendon or its insertion on the medial proximal tibia. 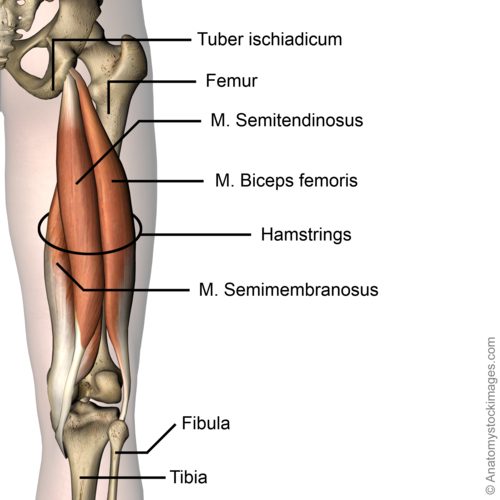 The tendon of the muscles that form the pes anserinus (m. Sartorius, m. Gracilis, m. Semitendinosus) run on the medial side of the knee and insert on the medial side of the tibial plateau just below the tuberosity of the tibia. There is a bursa under the tendon to smooth the movement of the tendons. It is often the bursa that will be ignited by excessive friction. The origin of the semimembranosus muscle is located at the lateral aspect of the ischial tuberosity, the muscle runs down the posteromedial aspect of the thigh and inserts at the posteromedial aspect of the knee. The muscle belly ends just above the knee joint and forms a thick rounded tendon distally, which passes medial to the medial head of the gastrocnemius but lateral to the smaller semitendinosus tendon. The most important function of the semimembranosus muscle is flexion and internal rotation of the knee joint. It also stabilizes the pelvis and causes extension of the hip joint. There is a U-shaped bursa that surrounds the distal SM tendon, separating the distal aspects of the tendon from the medial tibial plateau, MCL, and semitendinosus. Friction and repetitive eccentric tendon loading can lead to degenerative changes in the tendon and its insertions and irritation of the bursa. Grade 1 strains cause pain, but the tendon is not lengthened. Grade 2 strains include a lengthened ligament due to the ligament being stretched or partially ruptured. With grade 2 strains there is still function, although the function may be diminished. Grade 3 strains are characterized by a complete tear of the tendon or muscle, and function is usually impaired. Semimembranosus tendinitis is the result of damage to the semimembranosus tendon that results in an inflammatory response. Common mechanisms of injury include: Stress placed on the tendon due to a sudden increase in intensity, frequency, or duration of training and the body trying to compensate for other injuries of the lower extremity (meniscus tear). Risk is increased by activities that involve repetitive and/or strenuous use of the knee and hip (distance running, triathlon, race walking, weightlifting, or climbing , running down hills. poor strength and flexibility, failure to warm-up properly before activity, flat feet and improper knee alignment (knock knees or bowlegged). Typically caused by a primary phenomenon in endurance athletes or a secondary overuse compensatory condition from a primary knee abnormality. Other knee pathology often coexists, commonly Chondromalacia patallae and degenerative medial meniscal tears which may confuse the clinical picture and perhaps be involved in the cause. Elderly patients with osteoarthritis can develop semimembranosus tendinopathy in the anterior reflected tendon insertion secondary to adjacent osteophytes on the joint line. These patients also frequently suffer from concomitant pes anserine tendonitis. Total knee replacement components can also cause secondary semimembranosus tendinopathy. Some authors have noted a high predilection for females,but others have not. One might hypothesize that this is related to increased valgus stress and the Q angle present in women. Similarly, overpronation of the foot may cause increased valgus stress. Both conditions may increase friction between the medial femoral condyle and the SM tendon,but no studies have evaluated any of these variables as risk factors for semimembranosus tendinopathy. The presentation of semimembranosus tendinopathy can be variable but usually consists of an insidious, progressive ache in the posteromedial aspect of the knee. The pain may be severe in its acute form following a relatively sudden increase in endurance activity, such as cycling or running. Patients usually localize the pain at the posteromedial knee at the direct insertion, but pain may radiate proximally up the posteromedial thigh or distally to the medial calf. Symptoms increase with activities that involve significant hamstring activation- running, cycling, walking down stairs, or sudden deep knee flexion. Tendinopathy is a syndrome of tendon pain and thickening—the diagnosis is based primarily on patient history and physical examination. Magnetic resonance imaging (MRI) and ultrasonography (US) are the methods of choice for the visualization of the hamstring tendon complex. The advantage of MRI is better soft tissue contrast. It is more sensitive than US in detecting tendinopathy and peritendinous edema of the proximal hamstring tendons. The objective of imaging is to confirm the presence of hamstring tendon pathology and to assess the extent of the injury. A bone scan can also confrim its diagnosis. It shows increased tracer uptake at the posteromedial aspect of the proximal tibia. On physical examination, there is tenderness to palpation of the semimembranosus tendon near its tibial insertion site (or sites) or slightly more proximally. Resisted flexion of the knee at 90° can make the semimembranosus tendon more prominent for easier palpation. Passive internal tibial rotation of a knee flexed at 90° may localize the pain. Passive deep flexion of the knee may also exacerbate the pain as the affected tendon and/or insertion becomes impinged by adjacent structures. The hip, ankle, and foot morphology should be evaluated for biomechanical features that can predispose to semimembranosus tendon overuse. The patients were observed for a mean of 10.7 months (range, 1-12 months). Six patients were lost to follow-up because they underwent a surgical intervention: 3 (all in TCT group) were lost at 3 months; 2 (1 in each group), at 6 months; and 1 (in the TCT group), at 12 months. Primary follow-up was at 3 months after the beginning of treatment. The VAS scores in the SWT and TCT groups were 7 points before treatment (P = .84), and 2 points and 5 points, respectively, 3 months after treatment (P < .001). The NPRS scores in the SWT and TCT groups were 5 points in either group before treatment (P = .48), and 2 points and 6 points, respectively, 3 months after treatment (P < .001). At 3 months after treatment, 17 of the 20 patients (85%) in the SWT group and 2 of the 20 patients (10%) in the TCT group achieved a reduction of at least 50% in pain (P < .001). There were no serious complications in the SWT group. A common consensus on the best conservative management of semimembranosus tendinopathy is still lacking due to the low scientific evidence on effectiveness with interventions being used. Conservatively, traditional treatment methods for semimembranosus tendinopathy are by the majority comparable to those of other tendinopathies which includes relative rest and ice for symptoms relief in the initial phase, reduction or pause of sports activity, nonsteroidal anti-inflammatory drugs (NSAIDs), soft tissue mobilization, physiotherapy and continuous home exercise program focusing on progressive eccentric hamstring strengthening and core stabilization. The time to full recovery is normally between 1–3 months. Shockwave therapy is a safe and effective treatment for patients with chronic tendinopathy. Surgical management is reserved for those who fail to respond to conservative management for at least 3 months. A diagnostic arthroscopy should be included in surgery to exclude any intra-articular pathology. Several conditions can cause pain in the medial aspect of the knee including chronic MCL sprain, baker’s cyst, popliteal muscle strain, pes anserine bursitis and tibial osteonecrosis. Pes anserine bursitis is differentiated by a distal and anterior tenderness at the knee. Other conditions may predispose to, or be concomitant with semimembranosus tendinopathy, such as medial compartment OA, medial meniscal tears, semimembranosus bursitis or ‘’snapping knee’’ syndrome. Snapping knee syndrome is caused by subluxation of the gastrocnemius and semimembranosus tendons and typically presents in avid athletes. ↑ 1.0 1.1 Bylund, W. E., & de Weber, K. (2010). Semimembranosus Tendinopathy: One Cause of Chronic Posteromedial Knee Pain. Sports Health, 2(5), 380–384. ↑ Lempainen, L., Johansson, K., Banke, I. J., Ranne, J., Mäkelä, K., Sarimo, J., … Orava, S. (2015). Expert opinion: diagnosis and treatment of proximal hamstring tendinopathy. Muscles, Ligaments and Tendons Journal, 5(1), 23–28. ↑ 7.0 7.1 Cacchio A1, Rompe JD, Furia JP, Susi P, Santilli V, De Paulis F. Am J Sports Med. 2011 Jan;39(1):146-53. doi: 10.1177/0363546510379324. Epub 2010 Sep 20.Shockwave therapy for the treatment of chronic proximal hamstring tendinopathy in professional athletes. ↑ 8.0 8.1 8.2 Lempainen, L., Johansson, K., Banke, I. J., Ranne, J., Mäkelä, K., Sarimo, J., … Orava, S. (2015). Expert opinion: diagnosis and treatment of proximal hamstring tendinopathy. Muscles, Ligaments and Tendons Journal, 5(1), 23–28.